Tyvek – whether you know it or not, you are familiar with it. Ever seen a house being built or re-sided? It’s the paper stuff they stick on top of the plywood underneath. 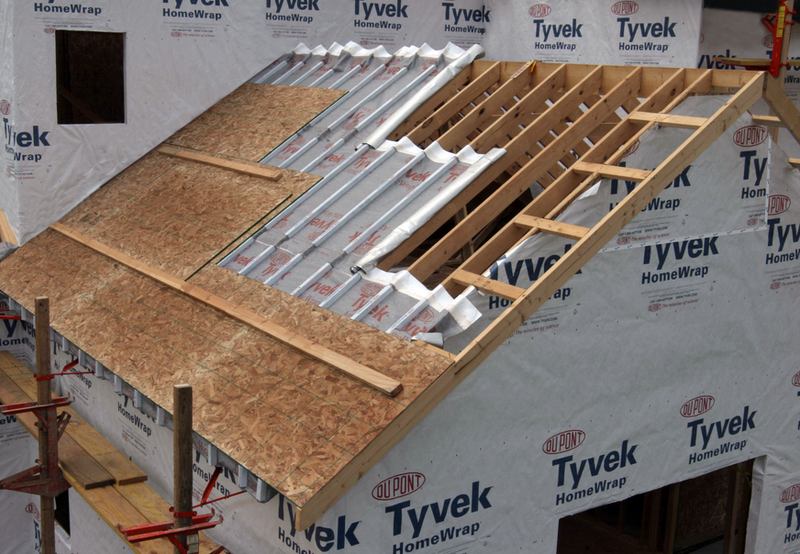 Tyvek (by DuPont) is probably the most common brand name of “house wrap”, that acts as a water-resistant layer between the wood structure of the house, and the siding. There are many brands of this, but, this is the “Kleenex” of water barriers for housing. Before I get into it, I do not own, and have never used any of the fancy new “space age” fabrics, except for eVent, but just for my compression packs. Just thought I should make that clear first. Enter in Tyvek. It’s cheap, you can find it in just about any size, and is more lightweight, durable, and waterproof than your average "run of the mill” tarp you can buy at any store that sells home improvement items. I have had a 6 x 6 Tyvek ground tarp for going on 12 years, and not one puncture in it at all. One season of a large 15 x 15 tarp for cleaning up leaves in the fall, and it ends up a shredded mess by the end of November. I recently purchased a 9×9 Tyvek tarp, and this one came with adhesive stick-on grommets. While this may seem a bit of overkill, it is again lightweight, can easily be strapped to the outside of the pack, and, provides a nice common area shelter, gear shelter, tent shelter, can be folded to fit as a ground tarp… whatever. I have a smaller 6×6 which I fold up to fit under my Eureka Solitaire tent, or, leave full size, depending on how the tent may be washed out… and then the larger 9×9 for optimal coverage. While I do not recall what the pricing was on my 6×6 (purchased it off of ebay about 12 years ago), the price for my 9×9 was…. wait for it… wait for it… $25.50. Yes. $25.50 (including stick on grommets, which are probably most of the cost!). Dollars to donuts, that’s the best price ever for a “ultralight” tarp. This entry was posted in Backpacking, Camping, Gear, Hiking and tagged atarps, Backpacking, camp, camping, Hike, Hiking, home wrap, homewrap, house wrap, housewrap, Tarp, tarpaulin, typar, tyvek, UL, ultra light, ultra lite, Ultralight, water resistant, waterproof. Bookmark the permalink.